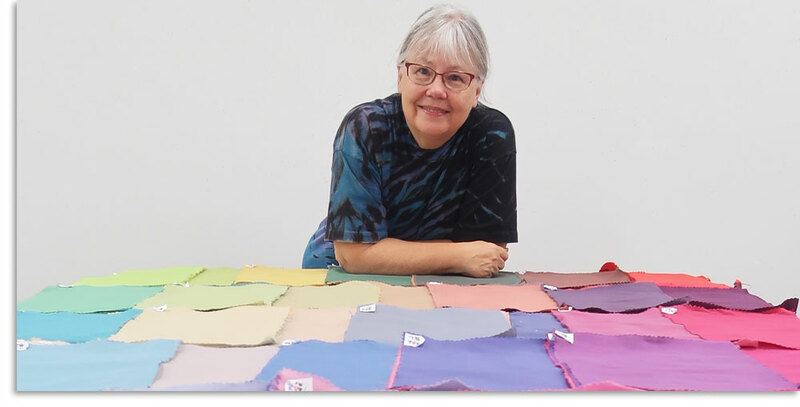 An artist and educator for 25+ years, Carol’s curiosity about the range of color derived from blending yellow, red, and blue dyes led to the creation of her Color Mixing system for dyers. 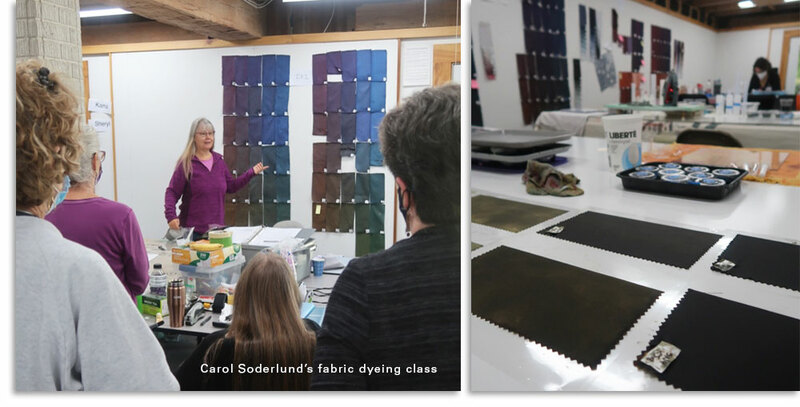 Carol encourages the freedom of mixing color by eye with results-based samples to guide the student, and also teaches simple methods for reproducing color on cloth. A former high school teacher, Carol loves to develop original course material and share this knowledge with her students. Carol was nominated for Teacher of the Year in 2013 and again in 2015 by the International Association of Creative Arts Professionals. 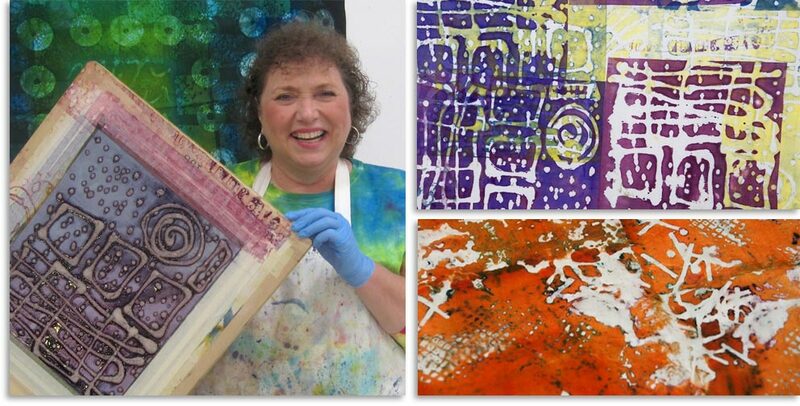 Carol has developed two NEW exciting classes for participants wanting to achieve a more sophisticated range of flat and glowing solids for their own compositional work. Students will learn how to get the results they want. 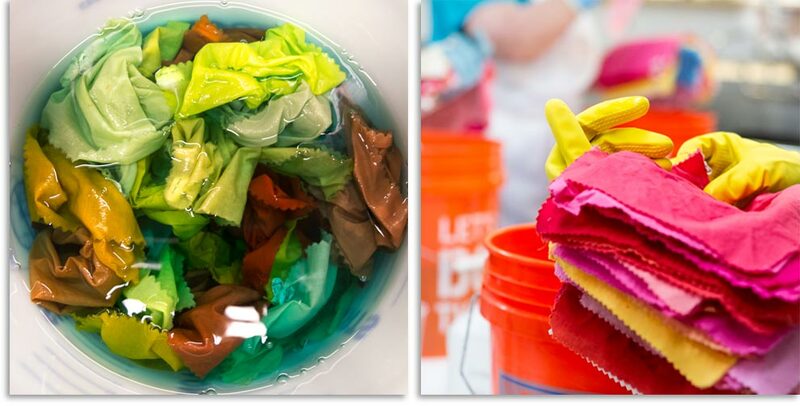 Along with this hands-on approach, students will come to understand color theory in three-dimensional model that goes beyond the color wheel. We will examine the difference between color theory and color reality, and break through the confusions of so many color systems that are not dye-based. 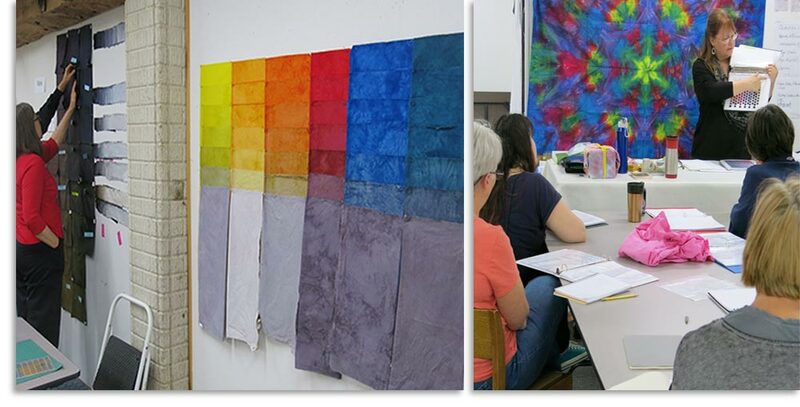 This course will be a wonderful foundation for wearable artists, quilters, needleworkers, weavers, and dyers of cellulose fibers and silk, or for anyone who wants to learn more about the interactions of color. • This year we return to the original color families, due to requests from students who want to add these colors to their collections! PFD (prepared for dyeing) fabric recommended. In addition to cotton, you may bring some silk, rayon, linen or tencel. Please contact Carol if you would like a more detailed explanation of pfd fabrics and where to purchase them. • 100 CLEAR page protectors - buy in bulk at office supply store: do not buy those that have holes through the main section of the page protector. You want the ones with holes through the a band on the margin. • Rotary cutter - bring a fresh straight blade as you will cut through numerous layers at once. The large (60 mm) cutters work the best for this. The 45 mm cutters can work but you must have arm strength. • Optional: June Tailor Shape Cut ruler (the large size) - This is particularly good for weavers and those inexperienced in rotary cutting. Sign up for JoAnn’s newsletters and they will send you 40% off coupons. The Shape Cut Ruler WILL NOT WORK for this class unless you have the 60 mm cutter, because of the number of layers we cut. • Optional: bed risers for raising tables for cutting. The Crow Timber Frame Barn has quite a few of these. If you are flying, these items can be obtained at the grocery store after arriving. Check with Carol first, because there may be extra supplies of these available. • One gallon milk jug - rinse all jugs, and be sure to keep the caps! The materials fee covers all the dyes and necessary chemicals, more than 100 pages of handouts and swatchbook pages, and all the fabric necessary for the sample book - approximately 7 yards per person. Carol will bring a variety of other equipment to use in class. 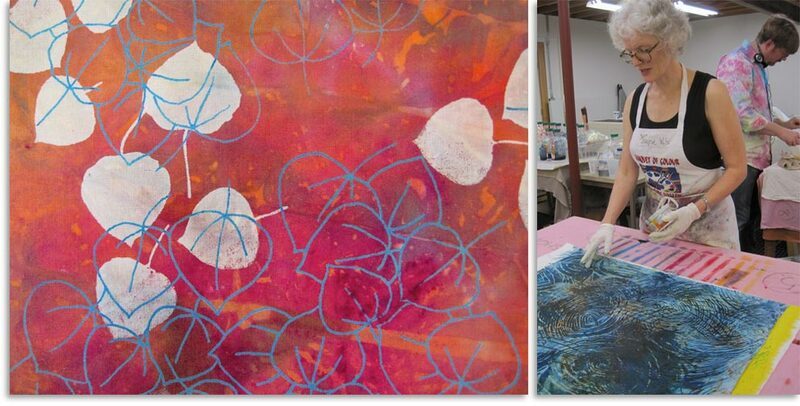 Of course, as artists in cloth, we want to translate these ideas to fabric, creating cloth that can convey pure, glowing color, that appears luminous when used, and creating partnered hues that are less glowing, less luminous, ready to be used as contrast in compositions. 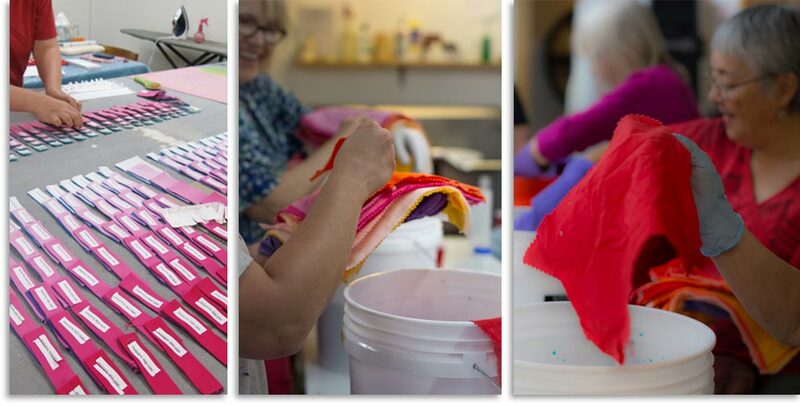 To this end, students will learn three methods of creating flat/glowing pairs in hand-dyed cloth with Procion MX dyes, using color recipes provided as well as color inspiration they bring from personal inspiration files such as paint chips, photographs, and swatches. In addition, we will learn four ways to create solid or nearly solid fabrics—two using low water immersion techniques and two using machines. 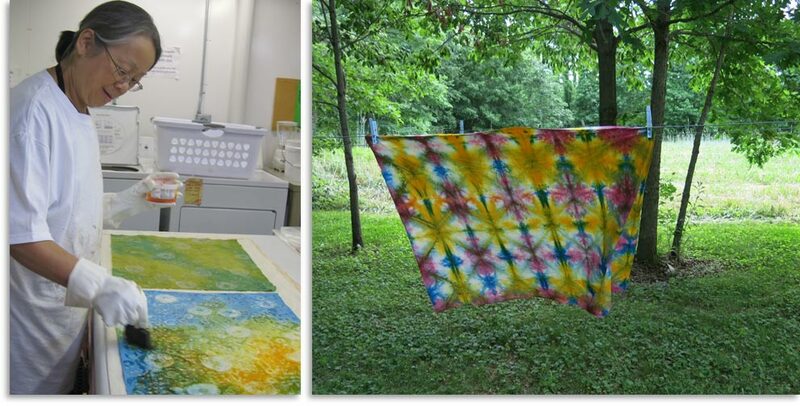 To this end, Carol will bring tabletop machines for student use, and will discuss the methods of using larger machines for solid color dyeing. 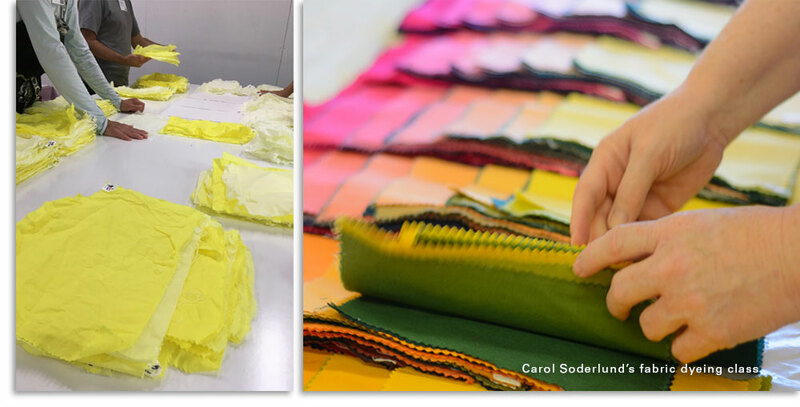 Students will dye up to one yard cuts of fabric pairs, testing the various methods presented. 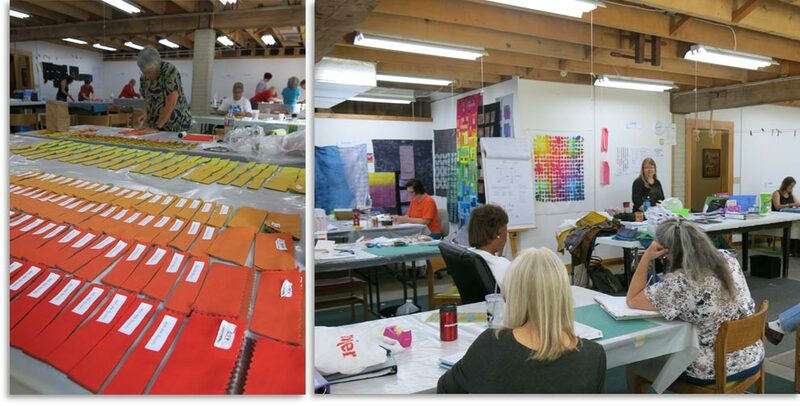 Swapping and sharing of color recipes and samples will follow, so that students will emerge with a notebook of flat/glowing pairs and how to achieve them in their own studio practice, as well as yards of paired flat/glowing cloth. Sustainability in dyeing has become an increasingly important topic. Methods of water conservation, both in dyeing and washout processes will be addressed. • 10-12 yards fabric for further dye explorations - PFD (prepared for dyeing) fabric recommended. In addition to cotton, you may bring some silk, rayon, linen or tencel. • 40 CLEAR page protectors (buy in bulk at office supply store) - do not buy those that have holes through the main section of the page protector. You want the ones with holes through a band on the margin. Sign up for JoAnn’s newsletters and they will send you 40% off coupons. The Shape Cut Ruler WILL NOT WORK for this class unless you have the 60 mm cutter, because of the number of layers we cut. • One plastic shoebox - measures about 13.5 x 8.2 x 4.8 inches. The exact size is not important…this is for reference. • Graduated cylinders - if you have some from previous classes, bring your 10, 50 and 100 ml cylinders. I will bring extra cylinders to share. • Panda washing machine - Carol will bring a number of these machines for class use. However, if you are driving and want to bring your own, feel free. The materials fee covers all the dyes and necessary chemicals, handouts and swatch book pages, and all the fabric necessary for the sample book. Carol will bring a variety of other equipment to use in class.